I walked away from this dialogue feeling quite stirred up and touched by the often heart-wrenching personal stories that were shared. “Is racism really about color, or is it about maintaining structural inequality so that a few can profit?” Questions are like doorways and guides for learning; I took this one with me from the dialogue. This event led me to reflect on my own orientation. I came to the U.S. when I was 21, and my childhood in Germany was of course quite different from those who grew up in the American South or New York or Los Angeles. My early life was marked by Germany trying to come to terms with the Holocaust. As a child I remember that we were not allowed to tell jokes about Jewish people, although it was quite all right to tell jokes about our other ethnicities or nationalities. I also recall that no Jewish people lived in our neighborhood, at least not that I knew of. As children we did not talk much about the Holocaust; we just knew that it had happened. I came to understand that it was difficult for my parents to live with the consequences of their country’s war. Later in school, learning about the Holocaust was a significant aspect of our education. But it was not until my studies in psychology in my 20’s here in the U.S. that I became aware of the huge shame that permeated the German spirit. During the dialogue on race I was relieved and touched when Germany was mentioned several times as a reference point of a nation willing to look at its cultural shadow and use its shame to not forget but to do what it can to enable social healing. Could Germany and its victims actually heal from the Holocaust? What about the shame I carry? Can I heal my own shame? Can I be hopeful without being naïve? These and related questions about racism, structural dominance and cultural shame recently came into the foreground in another context. 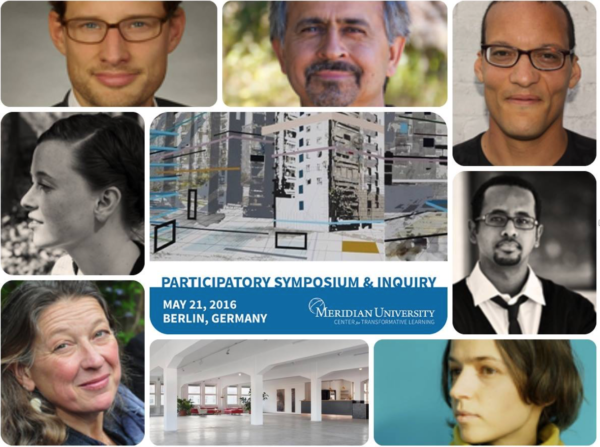 Last May David Sibbet and I were invited to be dialogue contributors at a symposium in Berlin on Imagination and Social Healing: Learning to Share Our Worlds. The symposium was hosted by Aftab Omer, who is originally from Pakistan and is the President of Meridian University in the San Francisco Bay Area, together with his colleague Martin Michaelis who does mediation in post-conflict areas in Eastern Europe and the Middle East. The timing of the symposium had everything to do with the current migration and refugee crisis in Europe as well as Germany’s leadership in trying to maintain open borders as a way to respond more humanely to the Syrian crises. As a city Berlin is a symbol for creativity, cultural diversity, and social experimentation. Within this context, symposium participants from all over Europe, along with a fair share of Americans, confronted a number of challenging themes. A second theme explored our sense of ‘home’. The sharing that ensued surfaced not only how distinctive our personal sense of home is, but also the diversity of the cultural inheritance in the room. As I listened to people’s descriptions of their sense of home it was easy to paint colorful mental pictures. When I think about home, I think about the desire to belong and the desire to be free. I left my ‘home’ country as a young adult primarily to be free to live a life that would not follow the patterns that had already been laid out for me. I stepped out of belonging and a sense of limitation into freedom, unfamiliarity, loneliness or marginality, and opportunity. For a long time I have made my home navigating the in-between. Now that is changing too. After 30 years in the U.S., mostly in California, that sense of difference and not really belonging has faded. I am fortunate. At the Berlin gathering we had intended to close the day by imagining what we might do to create a world in which the experience of home and belonging is possible without the influence of colonizing and disempowering structures and behaviors. Well, as you can imagine, this is a confronting question—worth exploring. But it is also a question that could easily make people throw their arms up in the air and simply resign to the possibility that our current situation, with all it social, ethnic, race-related and cultural disconnects, is as good as it gets. But really, I don’t think it is acceptable. During the day our hosts and facilitators, Aftab and Martin, held the agenda design with humility as well as a fair share of ambivalence. As the group explored topics such as colonization, the notion of home, belonging and freedom, several times the facilitators sought input from the dialogue contributors, checking to see if their approach truly yielded the kind of exploration, reflection, questioning, and interpersonal empathy that needs to be part of engaging a challenging topic like this. Later in the day Aftab and Martin opened up the process for input by the participants, leaving several of the dialogue contributors and participants feeling confused, frustrated, or even distressed. Were we not here to imagine and explore the possibility of social healing by relying on the symposium team’s expertise? Why would we need to reexamine an approach that was already laid out for the day? Why enter this territory of such uncertainty and ambiguity? Why subject ourselves to these challenging and ‘distracting’ feelings? Couldn’t we just follow the facilitators’ lead? I believe Aftab and Martin were right to hold the agenda design with ambivalence and humility. A design is intended to give form to a process that will guide how a certain content is engaged. Usually the intention is for a design and the way it is facilitated to become nearly invisible or move so far into the background so that the group can do the work of the day, focus on the content and achieve the intended outcomes. This approach works well in many circumstances. But what happens when the content of the day’s work also may include working with the very process, or let’s say imposed structures, which have organized the day? We have to consider that an imposed process, even if well-intended, could have a colonizing effect if not examined. As we—a group of people of highly diverse and multi-cultural backgrounds—seek to grow our capacity to share our worlds and enable social healing across cultures, we need to take responsibility for the possibility that we may be contributing to a colonizing process, and not just leave it up to our ‘leaders’. I see Martin’s and Aftab’s invitation to open up their facilitation and to invite us to co-create the remainder of symposium as one of those steps we need to take for us to learn more about co-creating our future, taking responsibility for our experience, and moving toward shared leadership. I believe that one of the most important muscles we need to grow is our capacity to truly share our worlds AND reflect on our process for doing that. Growing this muscle takes patience when we are frustrated, and commitment and curiosity when we feel overwhelmed or fearful, especially when working across racial and cultural divides. It takes examination and lots of experimentation. It invites empathy, care and humility. It requires being willing to make mistakes and learning from them, and it requires being willing to go out on a limb as Martin and Aftab did with hosting their symposium and Ronita did in hosting her dialogue. For me personally, this work requires courage and hope and access to opportunities to practice. Thank you Ronita, Martin and Aftab. And thank you Gisela, for your articulate sharing here. I found your post when viewing Grove Consultations. I met David Sibbett in 2000 at a conference honoring and exploring the writings and work of Arthur M. Young. Since that time, having raised children and creating a career in clinical chaplaincy, I find that “other worldly” issues continue to press against my heart. The “colonizing” and “refuge” dialogues are having a deep impact on our global consciousness, and as difficult as these shared “brave space” conversations are, I’ve become gentle in my compassion for this convergence of human experience. Your insights and deep intuition gives me hope that our imagining will bring about social healing. I Imagine, Therefore I Become which then leads me to consider, We Imagine, Therefore We Become.